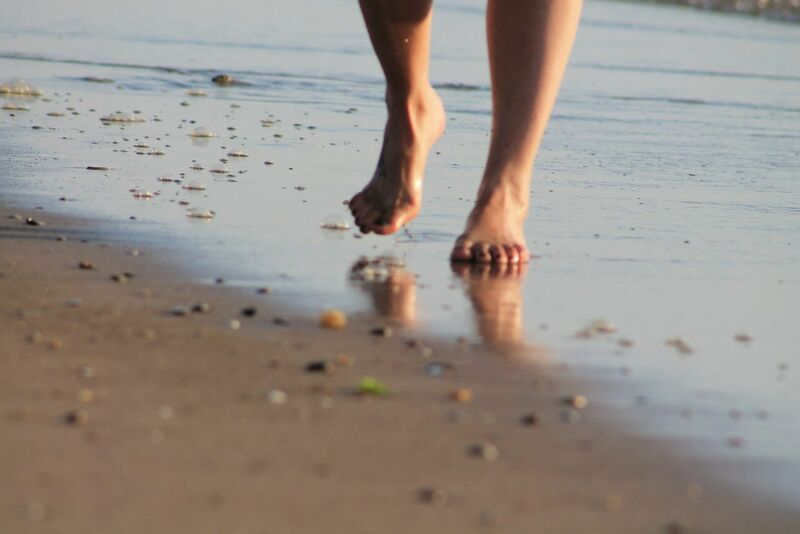 Is running barefoot right for you? Is barefoot running good for me? What is the best way to run? How should my foot hit the ground when I run? This continues to be topic of debate among many runners. There are several different parts of the minimalist running movement including barefoot running, barefoot shoe running, minimalist shoe running and forefoot strike running. These are all basically parts of the same theory, that running with less shoe (compared to a conventional running shoe) and landing on the ball of your foot (instead of the heel) is more natural and results in less stress on your joints. Let’s start by saying that we believe you should run however you want to run. Having said this, it’s important to address some of the myths and misinformation about the differences between the different running shoes and theories. Myth 1: Running barefoot or with a minimalist shoe and landing on the ball of the foot puts less stress on your joints. Truth: The force of your body hitting the ground is the same whether you land on your heel or your forefoot. You can’t fight gravity! What does change slightly is how the force is dispersed. Some studies have shown that forefoot strikers put slightly less stress on their knees when running because the impact is not directed straight up the leg as with a heel strike. Despite this possible benefit, however, you must remember that the force is still there, it just gets distributed more throughout the joint of the foot and ankle. You also exert more energy by landing on your forefoot because muscles must activate to keep the foot stable while the heel is off the ground. So, at best, the “less force” argument in favor of minimalist running is a wash. Myth 2: Running barefoot and on the ball of the foot is the way man was meant to run. Truth: This may be true; if you walked around barefoot your entire life, only short distances, ran very fast and/or don't weight much more than 100 lbs. However, most of us don’t fit into these criteria. We live in a shoed society, and are in shoes for most of our walking lives. Without practice we would have difficulty running more than a quarter of a mile without our heel hitting the ground. If you’re running much farther than that, and running at no faster than a six minute mile pace, chances are it’s easier and more natural for you to land on your heel and “roll” forward-just like walking only a little faster. Myth 3: Minimalist shoes are better for your feet because they encourage you to land on the ball of your foot. Truth: You can have your foot land however you want it to land in whatever shoe you are wearing! Minimalist shoes are lighter and more flexible, but there’s certainly nothing magical about them. They have less support and shock absorption capability than traditional running shoes. As a result your muscles have to work harder while you’re running in them, which can lead to a greater risk of injury. In addition, guess what happens to forefoot-strike runners as they start to get tired? They may still land on their forefoot, but the heel starts to come down to the ground. In many minimalist shoes the heel is actually lower than the forefoot. Your heel hitting the ground in a shoe like that is a recipe for disaster! Putting all of this into perspective, what is the take-home message? Is there a place for minimalist, forefoot-strike running? We believe that, for most runners, the answer is to run however it feels natural for you to run. You shouldn’t have to think about how your foot is going to hit the ground – just run! For most people, including those who are jogging a few items a week for exercise, 5K and 10K road warriors, or even avid marathoners, this means running heel-toe in a conventional running. There are a small percentage of people who will naturally land on the ball of their foot as a result of their foot structure, but that’s it. Is there a place for minimalist running? Sure. More serious runners who are looking to improve their races time can benefit from incorporating minimalist shoes or running barefoot on a soft surface into their training program. Any runner can improve foot and ankle strength and stability by using this type of training. The most important thing to remember is to not just “convert” and start doing all your running in this way. It’s very important that you start by doing only short workouts or small portions of a longer workout with this altered running style. If you build into it gradually you are much less likely to sustain an injury. If you experience pain in your feet or legs after running barefoot, andyour pain it is not improving after rest, visit a sports medicine specialist. With two offices in Long Beach, the team at Sol Foot & Ankle Centers is always conveniently located to make things easy for you. We take pride in the fact that our offices run on time, and we even have Saturday appointments available if you can't make it in during the work week. Contact us today to schedule an appointment by calling 562-433-0478.